Given the approach Amazon had taken with its e-reader line — upscaling the Kindle product set into the realm of a cheap and capable tablet computer — lots of folks expected Amazon might introduce a smartphone for the masses. This Fire Phone is *not* a volks-smartphone but instead a direct shot at the iPhone and the higher end of Samsung’s Android phone line, leaving some, like New York Times tech columnist Farhad Manjoo, to lament this as a missed opportunity. Me, I’d wager this is just Amazon’s first entrant in the marketplace. Given most any measure of acceptance, other Fire-branded phones — cheaper, and with greater appeal to a world market — will surely follow. What makes this phone different? Also unique to the Fire Phone is Amazon’s “Firefly” feature, which — at the press of a dedicated button — uses its audio and visual recognition capabilities to sample and identify music, television, movies, books, and games. Want more? Okay… business cards, barcodes, QR codes and a 100 million-plus database of consumer products. Is that a can of floor wax or dessert topping? Firefly knows. Capture, identify, and with a simple gesture, acquire. It’s left as an exercise for the reader (and for developers) to judge whether that’s Shazam for your life, or crack for online shoppers with poor impulse control. While brick and mortar retailers will worry that Firefly will take showrooming to a new level — and they probably should worry — I’m at least as interested to see how developers apply the Firefly SDK to create new applications that match visual and audio cues to databases that aren’t merely more naked consumerism: from art history to bird-watching, to medical imaging to… gosh, just imagine what the NSA might do with it. Or maybe not. And let’s not overlook one of the more liberating attributes of the Fire Phone: its access to unlimited, free storage for photos. Go ahead, snap as many selfies as you like. And in the negative column? I did mention this thing might be like crack to online shoppers, right? So, aside from rampant consumerism, let’s note that while the Android OS is at the core of the Fire Phone, it’s a code fork that Amazon has labeled Fire OS (it powers the Kindle Fire line of tablets, and the Amazon Fire TV ). 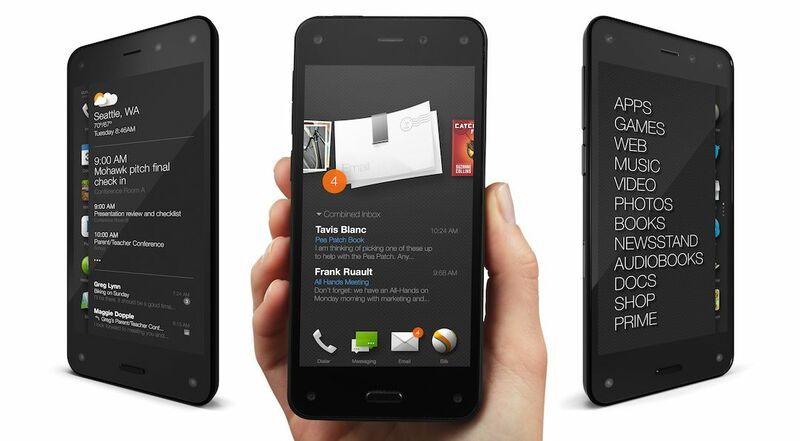 It’s possible Fire OS will not keep pace with advances (or security updates) in the Android OS. More, the Fire Phone will not have access to Google Play, Google Maps, Google Drive or the rest of the Google ecosystem, but will offer Amazon analogs, including its own App store. Amazon is offering some pretty generous incentives for developers to code for the Fire’s unique space, and with its uniquely featured SDK (dynamic display, audio and visual recognition, a library of intriguing new gestures) there’s likely to be a surge of folks eager to create the next breakthrough app… but it won’t happen overnight. Let’s be clear, absent some unforeseen issue — note, for example, we don’t yet know anything about cell phone reception, or mapping accuracy (cough, cough: Apple) — Amazon is likely to sell a lot of these phones, despite its high price and contractual lock-in. Perhaps, after they’ve covered a big ol’ chunk of their R&D costs with this first generation device, Amazon will likely follow with a “world phone” version. Or two, or more. Given Amazon’s unparalleled direct marketing reach, and its unique incentive to get a shopping appliance in the hands of as many online and digital consumers as possible, perhaps no-one else has quite so much to gain as does Mr. Bezos. Shazam, indeed.